Technology is such an integral component of the modern law office that we often take it for granted - lawyers are in the business of law after all, not IT management. Over time, subtle flaws in your system can wear down your practice, increasing costs and decreasing revenue. Let’s be honest - learning to use new processes and tools is a hassle. Purchasing and implementing a new system can be downright disruptive to firm operations, and you have a lot on the go right now. So your servers are aging and your software is out of date: if it ain’t broke, why fix it? Hassles aside, cost is a primary obstacle for most firms when it comes to upgrading technology. Service fees and set-up charges, new equipment, software and licenses -- the dollars add up quickly. But maintaining the status quo also bears a cost, and it’s often much higher than we realize. The reality is, using outdated technology can actually increase a firm’s costs and decrease its revenue. A lot of research and planning goes into purchasing and installing a new system, so it’s understandable why you may feel reluctant to let it go - you want to get as much as you can from your investment. However, technology doesn’t work this way and more often than not, it’s a losing strategy. Let’s explore why. In the tech industry, applications, software or equipment that have been replaced by more efficient or powerful versions are known as legacy systems. Developers will often compel their customers to upgrade by reducing or eliminating support services for previous versions, eventually rendering them obsolete. Because of this, using a legacy system to operate your business is risky business. Older equipment is less efficient, more prone to failure and very often vulnerable to cyber threats. It often doesn’t play well with new technology either: you may be tempted to cobble together a hybrid of new and old resources to save on costs, however you will likely find that you have to invest in even more equipment and software to find workarounds for incompatibility issues, which increases the potential for cracks in your security. So, how could your outdated technology be costing you? 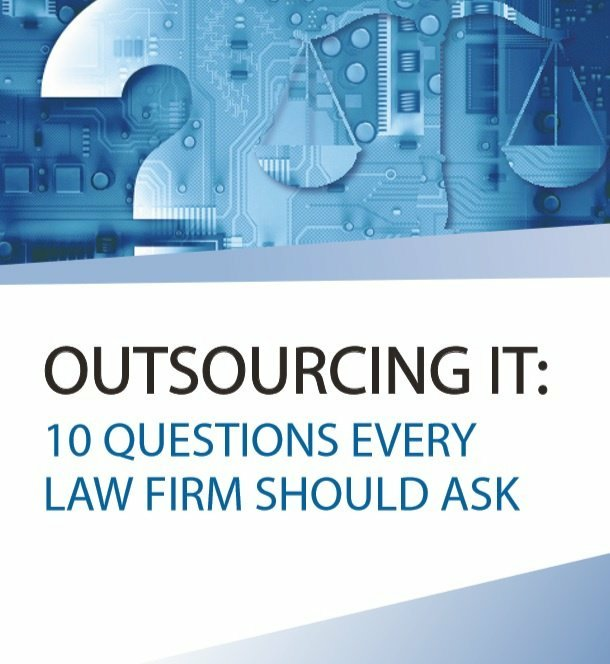 We compiled some of the more common problems we frequently hear about from law firms who come to us seeking IT solutions. Law firms have large amounts of sensitive and confidential information that can be valuable. Law firms tend to have large sums of money in their bank accounts. Law firms tend to have weaker security protection on their networks and systems. In June 2017, global law firm DLA Piper fell victim to a ransomware attack from an evolved iteration of a malware known as Petya. With a reported downtime of six days, the impact on the firm’s business was significant, with some experts estimating the financial damage to be in the millions. The good news is that the legal and IT industries have learned quite a lot from the experience and have implemented new safeguards. But the bad news: if a large, sophisticated firm like DLA Piper can fall prey to a cyberattack, what chance does a small or mid-sized law firm have? On the go? Download our convenient version of this article. Here’s the problem: in order for your technology to maintain adequate protection against security breaches, it requires regular security patches and upgrades that are proactively monitored and executed by an IT professional. IT managers must self-educate on a consistent basis, staying abreast of the new risks, patches and conflicts that may affect your system. Systems administration is a specialized field that requires vigilance in order to stay one step ahead of the system’s requirements. These risks are even greater and are far more complicated with older technology that may no longer receive regular support and updates from the manufacturer. As in the case with DLA Piper, one of the more popular hacks du jour is known as ransomware, in which hackers hold your digital records ransom, usually threatening to destroy them and in some cases, to expose them to the public. The Canadian Chamber of Commerce says a company’s average cost to respond to a data breach is $258 per record. For a small frim with a breach of just 2,000 records, the recovery cost would total $516,000. Whether those records are privileged case files, medical information, protected names, merger and acquisition details, financial transactions – the consequences for your clients, the involved parties and your law firm could be disastrous should they fall into the wrong hands. Consider how many and the type of client records your firm stores digitally – should you find yourself facing the worst-case-scenario, do you have the right people and technology in place to take action right away? For a business that operates by the billable hour, an extended downtime can be a hard hit. Just two business days without access to clients and files could represent 10 billable hours for one associate, anywhere from $2,000-$4,000 according to average billing rates. Remember that any losses from cybercrime that are not connected with the provision of professional legal services will not be covered under a firm’s standard malpractice insurance policy unless otherwise noted. These losses could include damage to equipment or software, business interruption, and reputational harm. $$ THE COST: Operating your business with outdated systems and IT management is risky business, with potential costs ranging from thousands of dollars to the viability of your practice. In a 2016 Thomson Reuters survey of lawyers, 69% of respondents reported they spend too much time on administrative tasks and 54% identified internal efficiency as a challenge. Technology is supposed to augment productivity by saving us time and effort and by reducing errors. But when outdated systems are slow or buggy, or if they lack integration with the firm’s other applications, it becomes a source of daily frustration. Employees are often bogged down by repetitive tasks, unnecessary duplication and by having to resort to time-consuming workaround tactics just to get the job done. According to Robert Half’s 2018 Legal Salary Guide, a mid-level law clerk in Ontario will typically make about $33 per hour. And this Robert Half survey claims the average office worker wastes approximately 91 hours per year due to IT-related issues. That’s a total of $3,000 of your law clerk’s time. The cost impact of associates and partners is of course much more – a fifth-year associate with a salaried hourly rate of $63 is looking at $5,733 wasted. Billable hours are far more complicated, but an associate who brings in an average of $250,000 at 1,700 hours annually will lose 1.75 of those hours per week, totaling a loss of more than $13,000 per year. $$ THE COST: Up-to-date technology enables you and your staff to increase productivity, while outdated technology can bring a cringe-worthy $20,000 cost in wasted time. Think of your dream client – an actual person or company you would like to work with, someone who would grow your reputation and take your practice further. Pay attention to their habits – does the client use up-to-date technology in their own business or in their personal life? Are they accustomed to fast results or to quickly doing things themselves on their mobile phone? Would your firm be able to accommodate the level of service they require? Today’s savvy clients don’t appreciate waiting on snail mail or having to print off and sign stacks of e-mailed PDF forms. They expect you to keep up with their own technology, and if you fail to recognize this, you do so at your own peril. For years, unclear and infrequent communication has been one of the most common client complaints received by Canadian law societies. It is imperative to maintain an audit trail of client communication, billing and document exchanges should concerns arise. If you are using multiple applications, databases and file structures, this can be a veritable nightmare. Larger firms are turning to technology like client portals to track their communication in a format that is transparent, secure and accessible to clients. Clients are able to access and review their files at any time, which helps avoid misinformation and cuts down on the and back-and-forth e-mails and phone calls that take up so much time. Businesses are under a great deal of pressure when it comes to privacy and security: provincial and federal protection laws are tightening, cybercrime is on the rise and their own clients are demanding more stringent measures to protect sensitive information. A consequence of this is that clients are demanding more stringent measures from their third-party representatives, including their law firms. If you haven’t yet been faced with a client security audit, consider yourself lucky. But if you represent commercial clients, it’s only a matter of time before they ask you to ensure your firm satisfies their strict security requirements. Will your legacy technology hold up to this test? Unlikely. 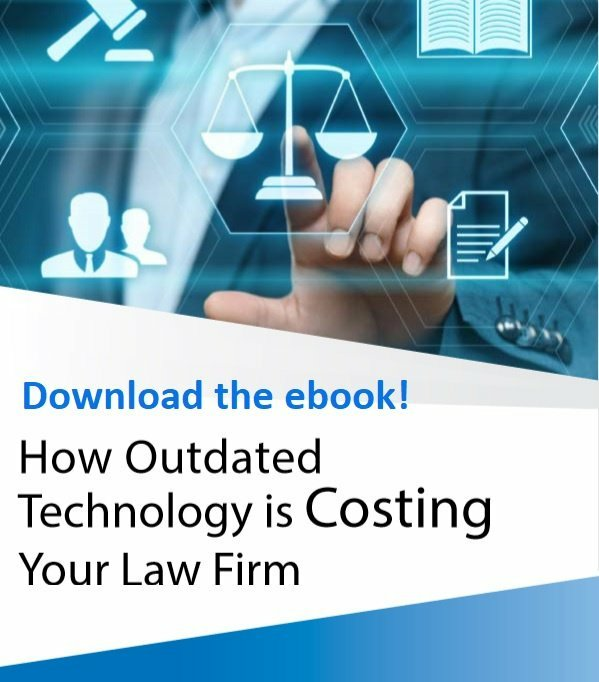 $$ THE COST: Outdated technology limits your ability to respond to the needs of your clients and to changes in the legal market. Whether you buy into this or not, your clients will – can you afford that? Ask yourself what kind of people you want working at your firm, and whether you can attract them with the tools you currently offer. If outdated technology prevents your staff from meeting their professional goals, it will have a negative impact on the quality of your hires. Failing to address it with existing staff could inadvertently lead to a perception that they are not valued, causing them to disengage or eventually leave. In a 2017 Deloitte survey of legal professionals across Canada, half of the firms identified staff retention as threats for the year ahead, and “89 per cent of firms noted that engaging and retaining millennials was a key issue.” The legal market is more competitive than it has ever been, and savvy lawyers know they must take an innovative approach to legal service delivery in order to get ahead. Can you offer lawyers the tools they need to meet their professional goals? Technology that will enable them to practice efficiently and to maintain a high level of service while balancing work/life priorities? $$ THE COST: It’s impossible to calculate the value of opportunities lost, but if you have the right tools to attract and support good talent, you can easily calculate the values gained. Whether you’re a technophile or you view technology as a necessary evil, up-to-date technology is necessary to keep your practice secure and competitive. So ask yourself, how much is your outdated technology costing you, and are you willing to pay the price? For more than 20 years, LexCloud.ca has focused on bringing the benefits of technology to Canadian law firms. Why Switch from On-site to Cloud IT? Remote Working: Are you secure? “We would not be the firm that we've been able to grow into without the technology we have." Toronto firm Stevenson Whelton MacDonald & Swan LLP needed a system that allowed their lawyers and staff to easily communicate and collaborate, working consistently no matter what office or off-site location they work from on a given day. 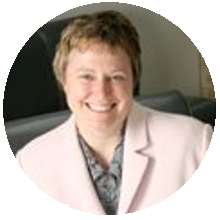 They opted for a private cloud IT solution, and Maureen can’t say enough about the benefits: “It has far exceeded my expectations. There is no difference between sitting at my computer at the office, at my computer at home, or at a computer in a hotel." 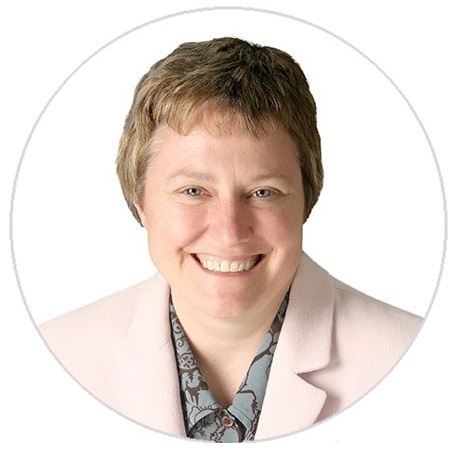 According to Maureen, choosing the right technology was “critically important to our practice” to be able to achieve the success the firm can now boast. Evans Bragagnolo & Sullivan is a full-service firm that operates out of three Ontario communities. The firm strives for excellence, both in the service they offer clients as well as providing a stimulating and attractive work environment for their lawyers and staff. “A key part of that attractive work environment is providing high tech” says senior partner Ted Tichinoff. Being a northern firm, the staff try to make the most of good weather in the summer, often working from the cottage or different vacation spots. They also have to deal with the challenges of winter weather and rural clients, staying accessible no matter what Mother Nature throws at them. By upgrading their system to the Cloud, the firm was able to seamlessly integrate the three offices into one collaborative system, ensuring their lawyers and admin staff have all the files and tools they need, accessible virtually anywhere. 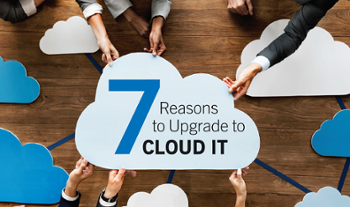 Receive more content like this with the LexCloud Blog! ©2018 LexCloud.ca All Rights Reserved.